This portrait-format book contains 56 pages with 125 good quality colour photos and 1.35 plans from Dirk Degenhardt. The text is in German and English. Krauss-Maffei Wegmann (KMW) handed over the latest version of the Leopard 2 main battle tank, the Leopard 2A7, to the German Army on 10 December 2014. The Leopard 2A7 was developed from the earlier Leopard 2A5, 2A6 and Leopard 2 Peace Support Operation variants, combined with significant input from operation of Leopard 2s deployed by Canada and Denmark in Afghanistan. 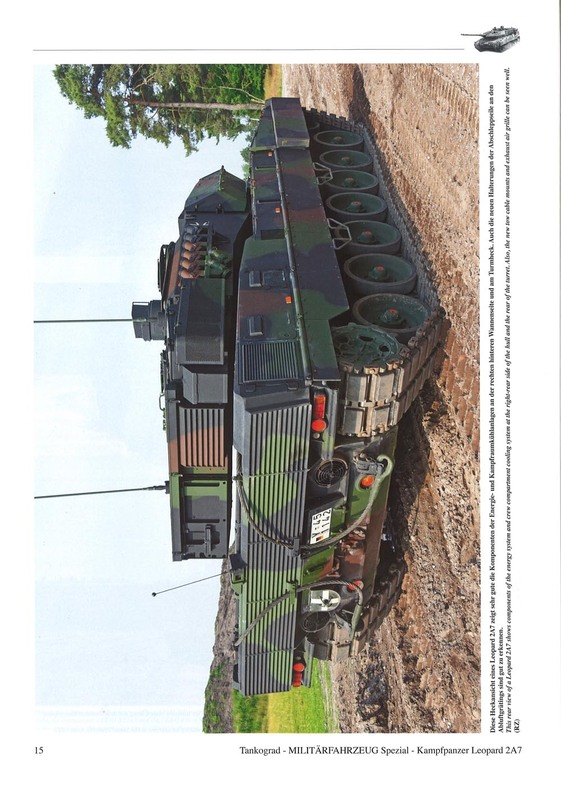 The German Army has ordered 20 Leopard 2A7s. 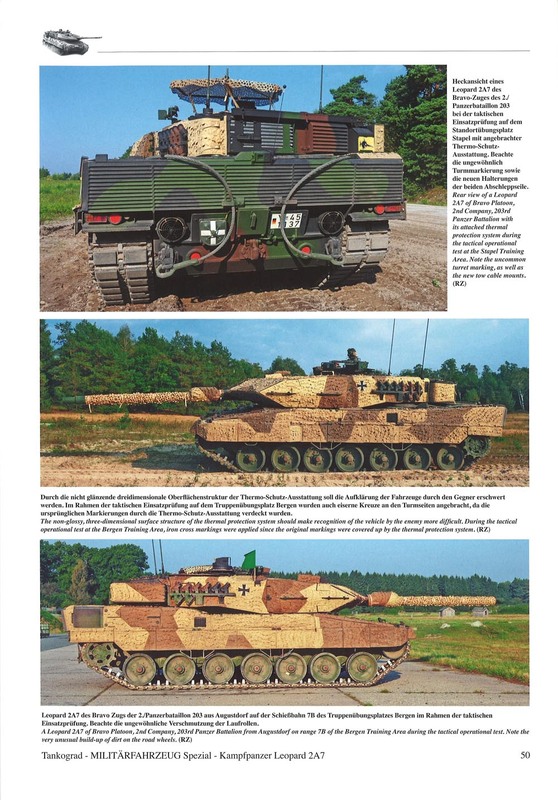 These are all conversions of ex-Royal Netherlands Army Leopard 2A6NL which were provided by Canada as compensation for the Leopard 2A6M taken from German Army stocks and upgraded for deployment to Afghanistan. The 2A7 has a number of survivability enhancements including the latest generation passive armour and belly armour providing protection against mines and improvised explosive devices. It is also fitted for, but not with, additional passive side protection armour. The commander is provided with a new roof-mounted stabilised panoramic sight that includes a third-generation thermal imager, laser rangefinder, and charge coupled device camera. The gunner also has a third-generation thermal sight. The first thing you notice from the above is that most of the chapter headings have not been translated into English in this book, as they have in other books in this series. This is the only (small) disappointment. 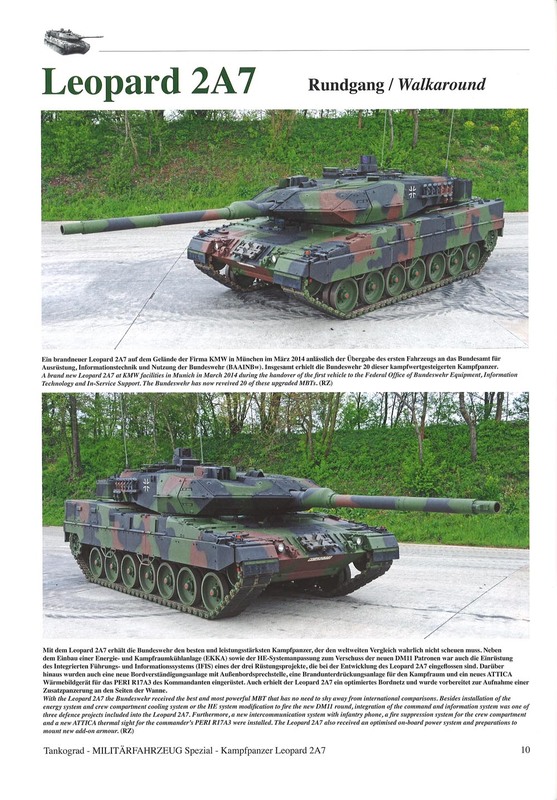 Well-known author, Ralph Zwilling, known for numerous publications from Tankograd Publishing, gives us a detailed view of Germany's latest battle tank, the Leopard 2A7, introduced in small numbers in 2015. 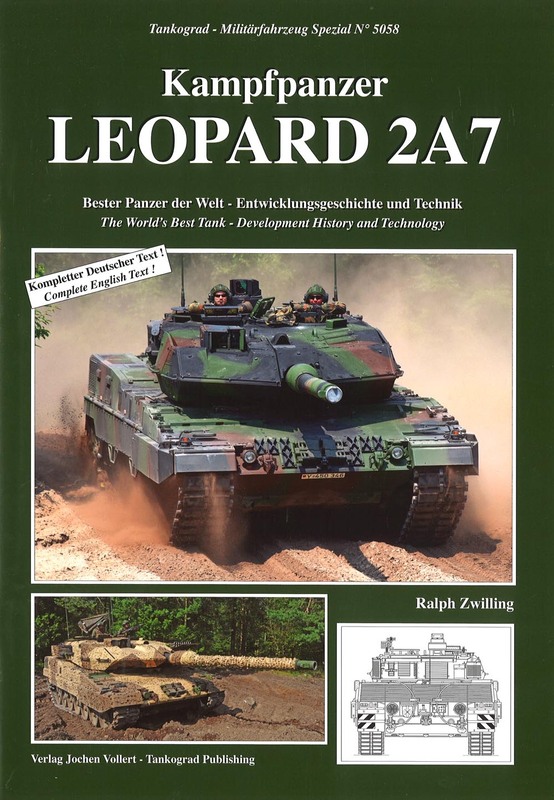 The book takes us on a trip firstly with a brief description of the Leopard 2s development since it has been in service. It then explains how Leopard 2 PSO/2A7+ and lessons learnt from various overseas missions has influenced the design and development of 2A7. The majority of the first half of the book is then taken up with walkaround photos showing overall views and more detailed shots of the hull, running gear and turret, interspersed with three pages of 1.35 line drawings. 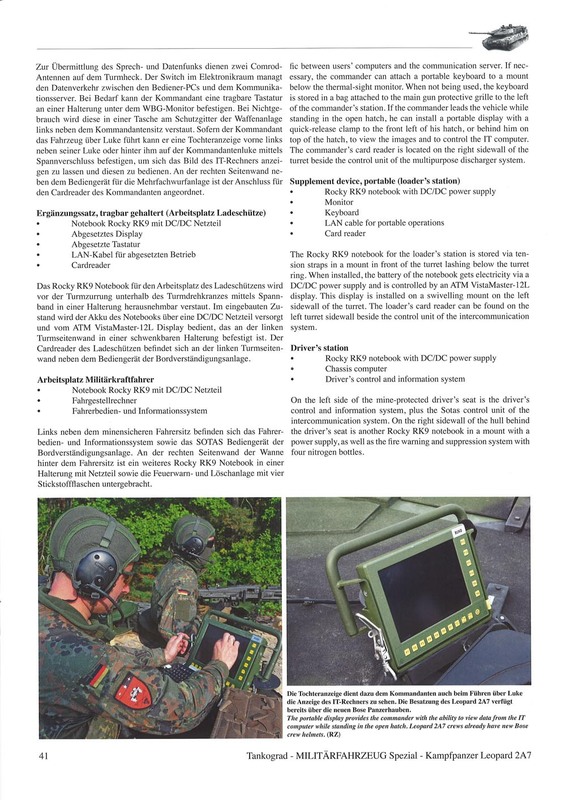 The book then goes into details about the new systems installed in the tank, described with German/English text and photos. It finishes off with photos of tanks equipped with Barracuda MCS. Most photos are two to a page, with additional pages featuring up to five photos. All of the photos include short captions in German and English. This is a book of the usual quality from Tankograd Publishing. 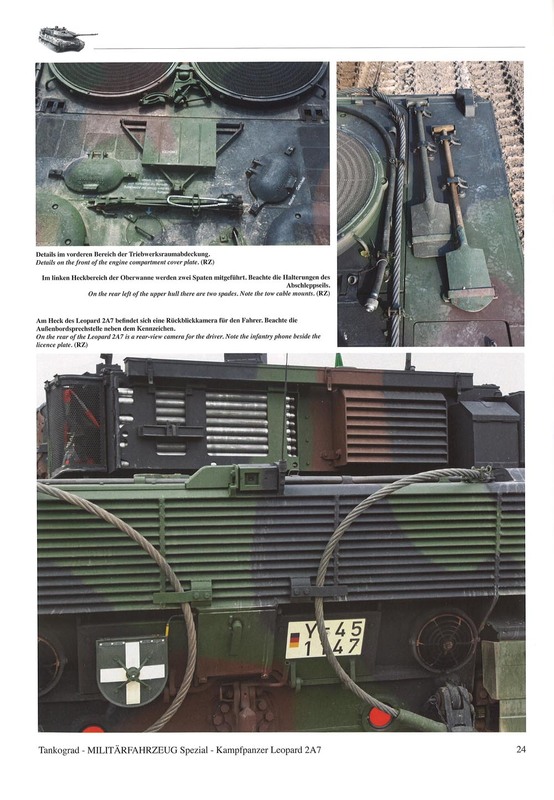 The high-quality, detailed pictures and text provide an insight into the Leopard 2A7 that has not been seen before in print. 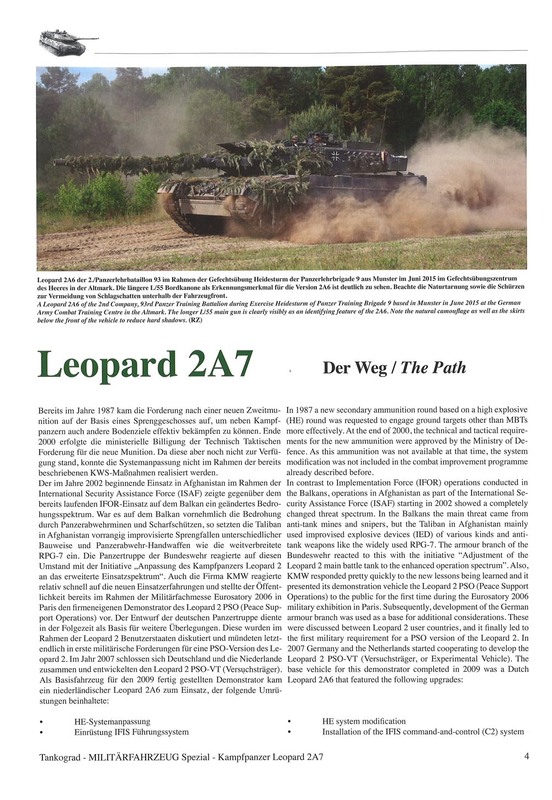 Currently, there is a lot happening in the world of Leopard 2. The basic design may have been in service since 1979, but its development has not stood still. There are currently quite a few strings of development for one of the West's most successful battle tanks and some of these can be quite confusing. This book will help clarify at least one string. I highly recommend this book to any Leopard fan or anyone interested in modern armour.